State partners from OMH and OASAS discussed the updated SDE policy and guidance aimed at improving access to Adult BH HCBS for HARP and HARP-eligible HIV SNP members not enrolled in Health Homes. 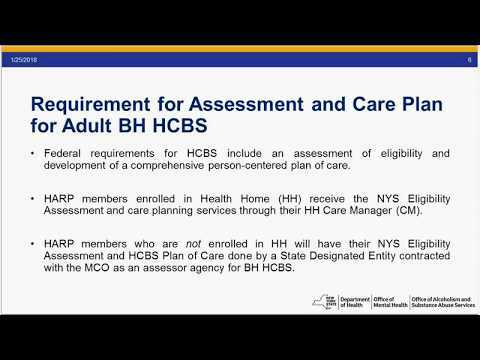 Policy overview: Effective April 1, 2018, in accordance with Appendix T of the Medicaid Managed Care/Family Health Plus/HIV SNP/Health and Recovery Plan Model Contract (Model Contract), HARPs and HIV SNPs will contract directly with State Designated Entities (SDEs) for the purposes of performing Adult BH HCBS assessment, referral, and HCBS Plan of Care development for HARP members that are not currently enrolled in a Health Home. The complete guidance is available for download below.